Following is an email I received from Floyd Brown from the Center for Western Journalism ~ Thomas MadisonHouse GOP Votes To Deny Obama’s Executive Amnesty… But Senate Planning A Betrayal. 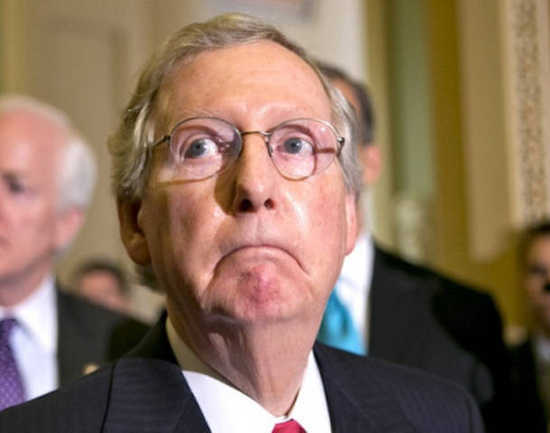 They honestly believe that you are stupid… Even though the House of Representatives has overwhelmingly passed a bill that defunds Barack Obama’s Imperial Amnesty Decree, GOP elites are working behind the scenes to ensure that the bill stays on Mitch McConnell’s desk and dies an unceremonious death. And, in the meantime, GOP elites in Congress are advancing another bill (the ill-named Secure Our Border First Act of 2015) that they’re deceptively promoting as a “border security bill”… but don’t be fooled… this alternate bill does NOTHING to advance a secure border and actually allocates even more taxpayer money to advance amnesty. As a matter of fact, it may very well be the mother of all amnesty bills. However… there is hope… Since this bait-and-switch plot relies upon deception… since it relies upon them believing that they’ve pulled the wool over your eyes… you can stop it from ever seeing the light of day, by making sure that our elected officials know, in no uncertain terms, that you are on to their little scheme… and to make that happen, we need to send an avalanche of Blast Faxes and phone calls to our elected officials right now. Use the hyperlink below to send your urgent Blast Faxes to each and every Republican Member of the United States Senate. Yes, as much as we hate to report it. GOP elites essentially baited you with a bill that defunds Barack Obama’s Imperial Amnesty Decree and intend to switch it with a fake“border security” bill that actually funds even more amnesty. You read that right, what GOP elites are touting as a border security bill actually tears down existing fencing and only requires that 27 miles of additional fencing be built and moreover, allows just about anyone to obtain automatic entry and benefits in the United States. Palinkas calls this betrayal a “global joke,” but we’re not laughing, and when we’re done blowing out fax machines and crashing phone lines, no one in Washington is going to be laughing either. Do These GOP Elites Honestly Believe They Can Get Away With It? The short answer is yes. Far too many politicians in Washington still subscribe to the ludicrous notion that you are either stupid or that you simply aren’t paying attention to what is going on. And they honestly believe that they can force amnesty on you if they pass an amnesty bill under the guise of border security. After all, since they don’t bother to actually read the legislation they pass, why should they believe that you bother to read the legislation that they pass. Well… this time around, they’ve been caught with their hands in the cookie jar. But these GOP elites aren’t simply caving to Barack Obama… they’re not reaching a deal… they’re carrying his water. If the staffer referenced in the above quote from NRO is correct, that means thatGOP elites not only want to give Barack Obama all the funding he needs to implement his unconstitutional amnesty decree by allowing the defunding bill to die in the Senate… They want to give him an additional 10 billion dollars to fund even more amnesty by passing this fake border security bill in its place. Republican elites are between a rock and a hard place. They want to accommodate the special interests with deep pockets who want amnesty but they know that patriotic Americans will scream bloody murder if they appear to push amnesty. Their solution: Pull the wool over your eyes and betray you. Remember, they sincerely believe that this little bait-and-switch scheme will only work as long as you are fooled by the sleight of hand. And now that we’ve caught them red-handed, the task before us is simple. If enough of us let them know that there will be hell to pay should they betray the American people, they WILL do the right thing… and that means that the future of this great nation, at this very moment, is in your hands.